The reasons stated for not punishing police go something like 'the police are doing their job' or 'in the line of duty, a terribly hard job witnessing incredible scenes etc.' well what of the gravedigger? Government officials and Politicians they didn't do it. Or they only half did it but that's a terribly hard job too. So Why? For instance: - You're the Premier who uses to be a journalist and your brother died as a result of a heroin overdose. You see a criminal as a dirty word. You are ambitious and a perfectionist. So you decide to make laws that are draconian and give police powers that are above the law, to 'clean up the heroin trade' all the while getting political points in diminishing high profile prisoners and especially 'anyone who would get in the way of your ideal image'. A 'wish' to say 'get rid of heroin'. You may extend powers of veto to other politicians, peek agencies, police, powers that are out-side the law, and you're thinking 'I will insure a better result for my brother'. However, police are autonomous and while you're not looking the extra powers led to police selling heroin for money. Now 300 children die of heroin overdose just like your brother. If I had a wish I would like everyone to obey the law. Link: Press Council news 1 February 1996 in his regular column, the Council's Chairman, Professor David Flint, discusses some ethical issues arising from media co-operation with police. After the Bondi Christmas Day riot, the SMH phoned Professor Flint to ask whether the practice of television stations handing over video footage to the police raised ethical issues for the media. He said it did. SMH reported 28 December 1995, Professor Flint said the media had to be very careful in handing over material, which had not been broadcast or printed. When the government manipulate the police service by stacking it and use the media to give it support then people are convinced, but not everyone. In late January Sydneysiders heard two extraordinary interviews by Richard Glover, presenter, ABC Radio 2BL with John Avery, former Police Commissioner and Evan Whitton criminal justice investigator. At that stage no one was looking at the Governments officials and their chiefs instead, they were looking at all the Indians. Evan Whitton: The first thing that happened when a uniformed policeman became recruited into plain clothes, was you were often sent to the Vice Squad. The first thing that happened when you were at the Vice Squad, was you were taken round to collect what he called 'taxes' and 'fees' from working girls and brothels. Richard: So it was part of the training? And if you did take the money, you could expect to go on to other squads Armed Hold-up Squad, the Break-in Squad, the Drug Squad and so on, elements of which also were very seriously into organised crime. Now we should say that it's obvious that some detectives managed to escape that net. Richard: But it was indeed a net. Evan Whitton: The older man got hold of a suspect and did the normal thing they do, steal the money the man has got, and he gave this detective $100 and the older detective gave WS13 dollars from the theft. Now he says that and he told Wood " I knew I was stuck". He said " I was starting out as a detective. I would have been branded as a dog, that's an informer, and my career would have been finished". What it does is that single act of corruption locks you in, even if you don't take another penny you are compromised for life. Richard: Compromised from day one. The article suggested the final report of the Police Royal Commission is in many ways a conventional, disappointing document, mostly relying on reshuffling management, 'back-to-basics' patrol policing, integrity based on individualism and increased police powers. For all the Commission's exposure of corrupt practices, there were hardly any recommendations for concrete measures, which would protect citizens from the demonstrated police abuse of existing powers. The government would do well to re-examine these areas. The strengths of the report were mostly already known. The Commission exposed and identified a wide range of corrupt practices than any inquiry before it. It detailed the much neglected and routinely denied 'process corruption': perjury, planting of evidence, 'verbals' or fabricated confessions, denial of suspects'rights' assaults to induce confessions, posing as a solicitor to induce confessions, tampering with electronic recording equipment. Few of these had previously been officially identified as 'corruption' though critics had spoken of them for decades. The Wood Report also failed on two important counts: it failed to support much-needed drug law reform, and it largely ignored community supervision of police. The Commission promoted a reliance on individuals and the so-called 'unquestioned integrity' of major decision-makers. Police Commissioner, Peter Ryan, it is said, has to be empowered and allowed to manage 'like any other CEO'. In the process, however, the belief in a healthy dispersal of power has been abandoned. Instead, we have the naive belief that an unsupervised, powerful individual working with similarly empowered local commanders can fix the systemic corruption of a very large organisation. Giving greater powers to the Commissioner and Commanders necessarily means stripping away of the rights of those working under them. Police reacted with understandable anger to the abortive move to remove their rights to appeal a dismissal. "Crims can appeal, why not us they asked, quite reasonably. Special Branch returns and police powers must be extended: what's new? 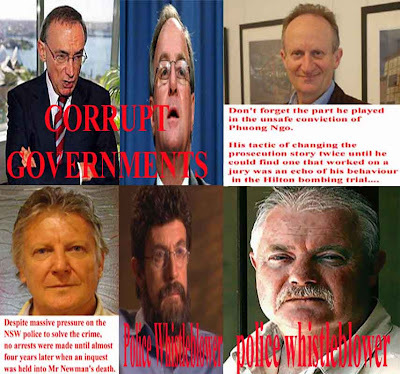 The Protective Security Response Group proposed by Police Commissioner Peter Ryan, within weeks of the abolition of the old Special Branch, was simply rubber stamped by the Royal Commission. With no independent analysis, or explanation of what was wrong with the old political police, this new group was rapidly proposed (presumably because of fears for the Olympics) with a very similar brief and just a few new supervisory rules. The Government should give this more thought. New emphases on community supervision of police, restitution for those victimised by abuse of police powers, and a respect for civil rights of both police and citizens would better address the problem.